This is the official “Frequently Asked Questions” of the Google Analytics Opt-Out WordPress Plugin. You need at least WordPress 4.8.0 running on your self-hosted installation. Optional: Google Analytics for WordPress by MonsterInsights. 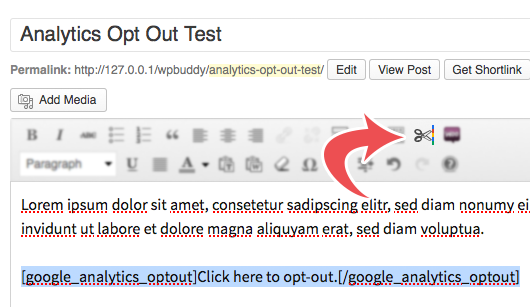 The plugin shows a little banner with a hint that lets a user opt-out of Google Analytics. Then the banner will fade out or will show a little information window on the bottom right. Read more about the Analytics opt-out functionality on Googles Help pages for ga.js or analytics.js. The free version only allows to add a special link to your privacy page (using the shortcode). The pro version shows a banner an all pages instead and has various settings options, too. Install the plugin according to the installation instructions in the PDF that was delivered with the plugin. Can I add the link into the content area? Yes. For this just use the “cut”-Button in the editor. Note that this button only appears if it has been activated in the settings section. Is this a proper implementation of the EU-Privacy Directive or the GDPR (General Data Protection Regulation)? First of all: The installation of this plugin does not replace any legal advice you might need to put the EU-Privacy Directive or the General Data Protection Regulation into practice accordingly. How can I style the banner? Can I hook into some functions with my own plugin? What are the shortcodes that I can use? Integrates a link into any WordPress editor that allows a user to opt-out off Google Analytics. Can be used for a external link to close the opt-out banner.